Methane-burping sheep: curry spices to the rescue? Cumin, coriander, clover, turmeric...hold the cinnamon. British researchers are in search of the right spicy recipe to reduce agricultural methane emissions. A steady diet of hay, wheat straw and rice straw gives sheep gas—the burping kind. While sheep and other ruminants don't seem to mind about manners, there is concern over these burps containing methane, a potent greenhouse gas. Adding a bit of spice—cumin, coriander, clover, turmeric—to the bland meals of fiber-rich grasses, however, may help reduce flatulence on the farm up to 40 percent, says a study published in the Asian-Australasian Journal of Animal Sciences. 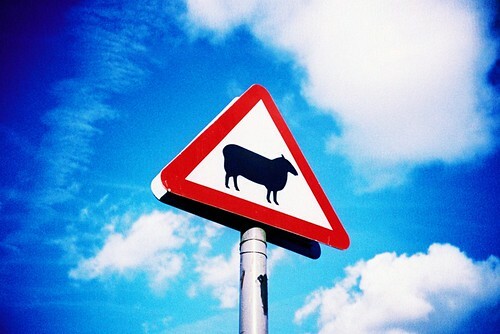 There are around 30 million sheep in the UK, each producing around 20 litres of methane a day, emitted by burping. Methane (CH4) is more than 20 times as powerful in terms of causing global warming as the main greenhouse gas, carbon dioxide (CO2). As well as the environmental implications, the sheep itself also loses an estimated 12 per cent of its food energy to methane production, resulting in a lower milk and meat yield. Researchers at Newcastle University have been measuring the effect that common spices, such as those found often in curries, have on the slow digestive systems of ruminant livestock when ground into their feed. The European Union banned supplementary antibiotics to livestock animals in 2006. But the spices, working similarly to an antibiotic, kill much of the methane-producing bacteria while promoting types of bacteria that help improve digestion. The researchers awarded the blue ribbon for gas busting to coriander, with methane reductions of about 40 percent. The runner-up was tumeric at 30 percent, followed by cumin at 22 percent. Cinnamon, my personal fave, didn't do so well...figures. However, the study says the best choice of spices for feed supplements will likely depend on what the animals are foraging. Lead researcher Abdul Shakoor Chaudhry expects similar results for cows and goats. With an estimated 10 million cows in the UK, each producing around 500 litres of methane a day, that would be a significant reduction. Since antibiotics were banned, the hunt is on for new, safe, cheap ways to reduce methane production in ruminants. Plants like coriander are an ideal solution, especially in parts of the world where expensive treatments are not an option. I can't help but wonder if the gas relief will carry on to the humans that eat these animals. Probably not, but here's hoping. Energy on the rocks: is combustible ice in our future?